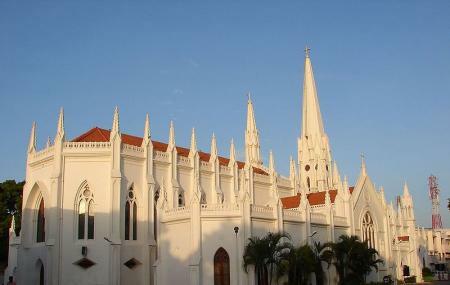 One of the very few Gothic churches in Chennai, the San Thome Church with its unique location is one of the most important attractions of Chennai. The church is set picturesquely on the mortal remains of one of the twelve Apostles of Jesus Christ. The church derives its name from Saint Thomas, who came to India A.D.52 and died in A.D.72. The significance of the church amplifies further with its being as one of the only two other Basilicas in the world that are built over the tomb of an apostle. Another feature of the church, underground chapel draws curious visitors. If you are a history buff, or someone who is fascinated by the intricate details of Portuguese style architecture, you are certain to be bowled over by this Chennai attraction. Also, visit the popular attractions in the city by following Chennai itinerary 1 day. How popular is San Thome Church? People normally club together Mylapore and Marina Beach while planning their visit to San Thome Church. An iconic pilgrimage spot for Christians. Specially in South India, this Church has an ancient history & continues to attract millions of visitors throughout the year. My 1st visit was way back in 1988 when I was going to school nearby the church. I used to go there almost everyday after school to spend time in prayer. Recently I noticed the church has undergone renovation & it's looking even better. The tomb of St. Thomas is kept in an underground chapel. This is located in the heart of Chennai near the Marina Beach. This Church was built on the tomb of one of the twelve apostles of Jesus Christ...whose name is Saint Thomas. It welcomes both the religious and non-religious people with open arms. This place is must for those who are visiting Chennai. There is no entrance fees. Moreover it has a paid washroom and a free parking lot too. Overall this place is great !!! One of the more serene locations in Chennai... A one of a kind on the global map -in that-the original church was built by St.Thomas a disciple of Christ.. a honour only paralleled by St.Peter's Cathedral at the Vatican..